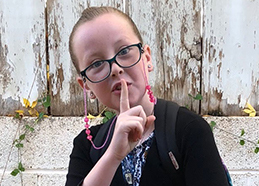 With such remarkable students, teachers, and programs, it’s no wonder we have a place on our website dedicated to sharing our great news. Here you’ll find the latest information on recent events, upcoming activities, student/teacher honors, and much more. Be sure to visit often! 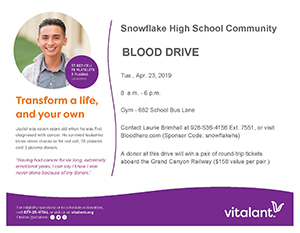 Snowflake High School is hosting a blood drive on Tuesday, April 23 from 8:00 a.m. to 6:00 p.m. in the high school gym at 682 School Bus Lane. Please contact Laurie Brimhall at (928) 536-4156 ext. 7551 or visit the Blood Hero website (sponsor code: snowflakehs) for more information. A donor at this drive will win a pair of round-trip tickets aboard the Grand Canyon Railway ($158 value per pair). 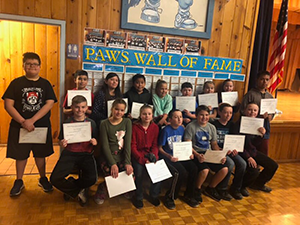 Snowflake Intermediate congratulates our PAWS Citizenship winners! For your convenience, you will find copies of the Home and School/Reading Connection below.